This image is from Etsy, but unfortunately the particular item is no longer available for sale. Many of you have probably seen the quote referenced above. There is no doubt that riding different genders of horses is extremely different. There is also no doubt that many equestrians tend to prefer one over another. You have your “gelding people” and your “mare people.” I don’t know if I’ve ever met or talked to anyone that preferred to work with a stallion, but I am sure they are out there. For much of my riding career, I only rode geldings. I think the first mare I rode was after I had been riding for a good 10 years. Most of the mares I had experienced once I started going to different barns were, to be frank, bitchy and unpleasant to deal with. I much preferred geldings over mares. I just clicked with them better. Unfortunately, my lack of experience with mares added with the fact that my trainers that had me ride mares never explained to me the differences between mares and geldings had soured me to working with mares. Me riding Honor, one of my barn’s sale horses. She is one of the most pleasant mares I’ve worked with, and I love riding her. It wasn’t until my current barn and my current trainer that I fully understood how working with a mare is completely different than working with a gelding. And, I also discovered that not every mare is mare-ish. Some are actually very pleasant to work with and ride. In fact, my barn owner has told me that having a relationship with a mare is one of the best horse relationships you can have because when you really click with a mare, they give you their all. They want to make you happy and do what’s right, and they truly cherish their relationship with their human. There is no doubt that mares are much more sensitive than geldings. They can be more temperamental. They need to be ridden a certain way and worked with a certain way. Oftentimes, you cannot demand things from them like you would a gelding. They will test you, but, they are also incredibly loyal. When you earn their trust, you know you’ve done something right. If you respect them, they will respect you. And, while I have not yet experienced this myself, I have heard that a bond with a mare is like no other. Senior Editor Liv Godfrey has her own chestnut Thoroughbred mare, Lulu. She gave her thoughts on what it’s like working with a mare. Lulu is my first young horse and off the track Thoroughbred that I started from the beginning. I taught her how to be a rideable jumper that happens to love jumping and being in the jumper ring. She has taught me so much over the past two, almost three years. 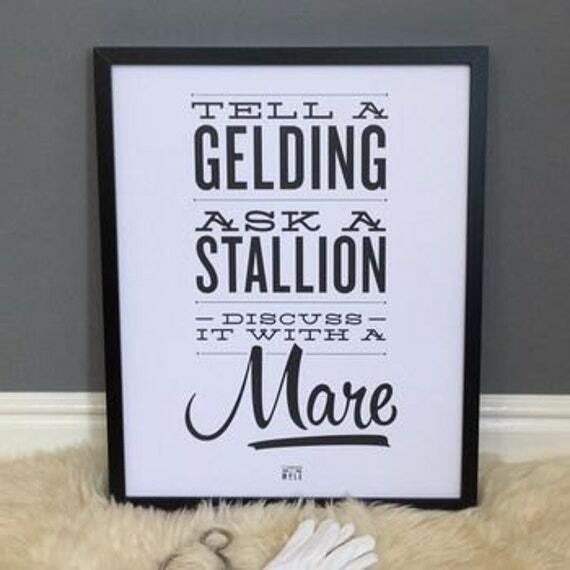 I truly believe mares are a completely different ball game than geldings. Mares just have different personalities than geldings. Geldings tend to be more happy go lucky. Mares give their all to people that they trust and that they like being ridden by. A connection with a mare feel likes a different kind of connection, especially when you click with the mare. It teaches you to constantly want to be a better rider. Personally, my mare make me strive to be a different, more motivated, stronger person. Olivia and Lulu in the jumper ring. I’ve found when you ride a mare you need to constantly be talking to them and figuring out what will make them go their best depending on how they’re feeling that day. For example, sometimes Lulu goes like a little hunter, and some days she will throw harmless, sassy bucks in when we are cantering around the ring. When I am spending time with Lulu on the ground, she has a different kind of attitude. I feel like I constantly have to remind her how pretty she is in order to put her in a good mood before I get on! Oh, and lots of treat help too….. Overall mares are the best, in my opinion. When an equestrian is patient and listens to a mare, he or she will learn what buttons to push to make a mare go the best she possibly can. For me, that also involves a lot of good training from my trainers. Personally, I highly suggest working with professionals, even if you can only afford to once a month. Working with a professional helps a lot, sometimes more than one cares to admit, when you have someone on the ground observing and giving you suggestions. 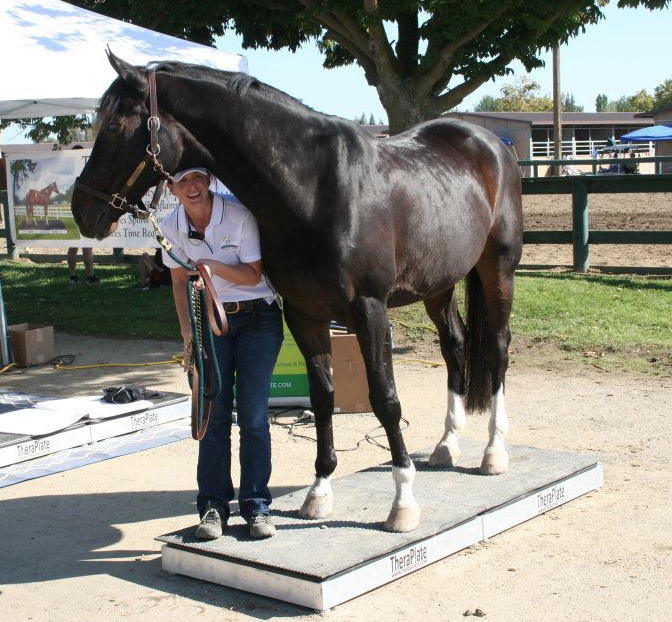 To wrap it up, mares are the best when an equestrian is able to connect with them and take one’s time to understand their personality. I personally do not think people give mares enough credit all the time, but as far as I am personally seeing, some of the nicest horses (Sapphire, HH Azur, Cylana, etc.) in this era are mares. Take your time. Understand what makes them tick. A mare will be the best teammate you could possibly ask for. Written by Katie Stone, assistant editor. Erin Condren Life Planner. 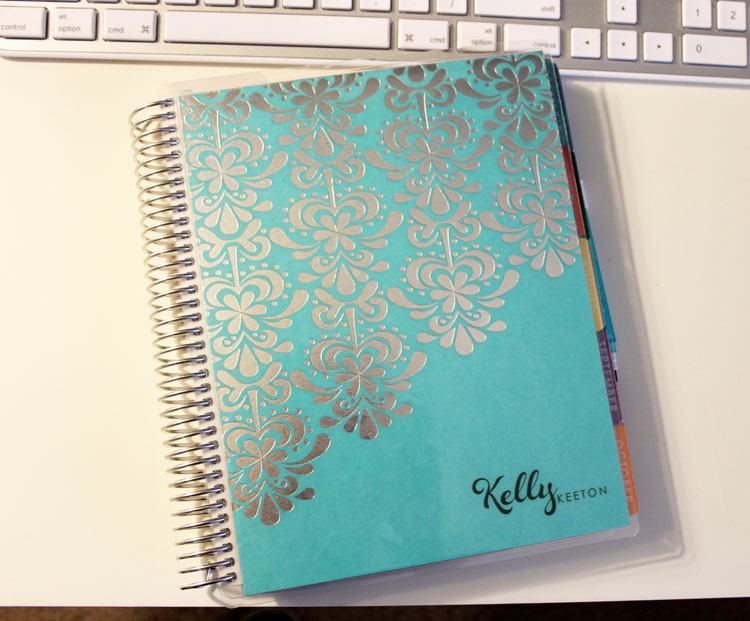 The planners are fully customizable down to the metal binding color! For the last two years I have bought two Erin Condren Life Planners and used them. However, in the past few months I had been struggling to find a planner for 2017 that would be versatile for my life. I am extremely picky about the planner I use and after searching online and in many stores, I was still unable to settle on one that I liked and fit my needs. During this time of research and searching, I found the bullet journal idea on Pinterest! For me, bullet journaling is my way of creating a planner that has everything I need and nothing I do need. It allows me to keep everything I want and need in one place, whether it is travel information, reminders for school, or important horse information. This method is also not confining. I can design my weekly page however I want, and I can include a page of notes or a big to-do list wherever I want. One example of bullet journaling. To bullet journal, any notebook or type of paper can be used. However, it is common to use a notebook that is dotted to help create straight lines without it looking too busy (This is also the method I prefer). I purchased a hardcover Moleskine from Amazon for around $20.00. Another common brand is Lechttrum 1917 (available at Amazon here), which is a little more pricey (some models are $29.99 while others are less) but does have numbered pages and an index. Personally, I use a pencil when journaling because I have found that pen bleeds through my Moleskine journal. (Note: It bugged me so much when I saw how bad it bled through!). In the Moleskine, the pages are not numbered, so I numbered them myself and created an index. After doing those tasks, I began with a monthly calendar for October. After the monthly calendar, I created a weekly one for the first week of the month. For the monthly calendar, I used a single page, and for my weekly layout, I had to use the 2 side-by-side pages. During my bullet journaling, I was going to be traveling, and I put all of my travel information, the weather for my destination, and a packing list on one page. I am also the media representative for my IHSA team, so I have a page of the riders, their divisions, and their class standing to help when I have to do write-ups after a busy weekend of showing. I am only on page 19 of my bullet journal; I haven’t really done much “fun stuff” yet. Another example of bullet journaling from Buzzfeed.com. 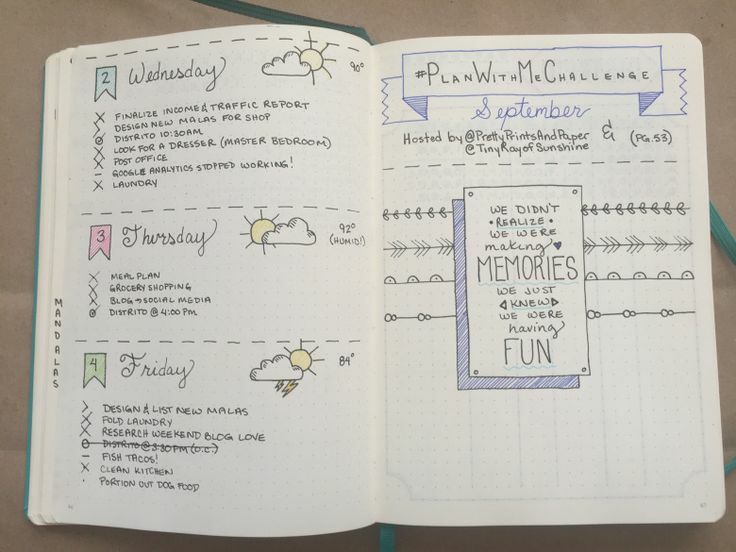 If you are looking for some inspiration or ideas for your own bullet journal, definitely check out Pinterest and Instagram. These mediums and their content can inspire you. However, be sure to make your bullet journal unique to you and your preferences! It is worth noting that bullet journaling isn’t for everyone. If you want to ascertain if bullet journaling is for you, take any notebook or piece of paper and give it a try. The great thing about bullet journaling is that you can design it however you would like. It can range from little notes that you jot down or a full-on spread of everything in which you are involved. For more information on this journaling technique, you can visit one of Buzzfeed’s many articles on how to bullet journal (or simply google ‘bullet journaling’).